An old variety created at the end of 19th century. 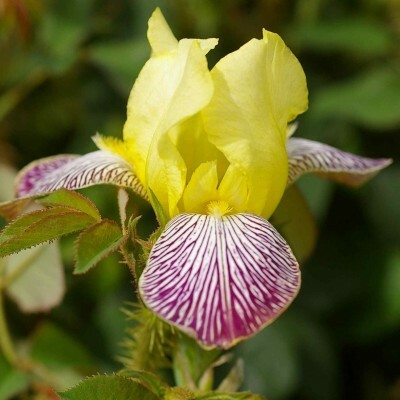 Numerous small flowers with pure yellow standards and nearly horizontal white falls, strongly streaked with magenta. Pure yellow beards. Often produces several stems per rhizome from the start. Diploid iris, like the Cayeux variety "Ma Mie". 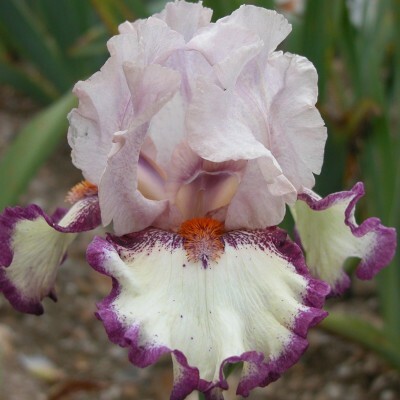 Pale lavender-pink standards, cream falls with a fine, precisely marked, purple border (5 mm). Wide orange-red beards marked to the tips with streaks of purple dots. Medium-sized, compact flowers with lively ondulations. 8 buds.